MAD Magazine Talk about a dream come true! I remember going to the grocery store with my mother hoping the latest issue of MAD would be there--the first thing I would do is read all of Sergio Aragones margin cartoons. It always amazed me that he could tell so much without any captions! I remember getting a copy of MAD at 14 years old while I was in the hospital just after appendix surgery (violins playing)... They told a joke about the New York subway system being cleaned with "urine-scented" disinfectant, and I almost burst my stitches laughing. From there on, I had to laugh through my gritted teeth and it was extremely painful. 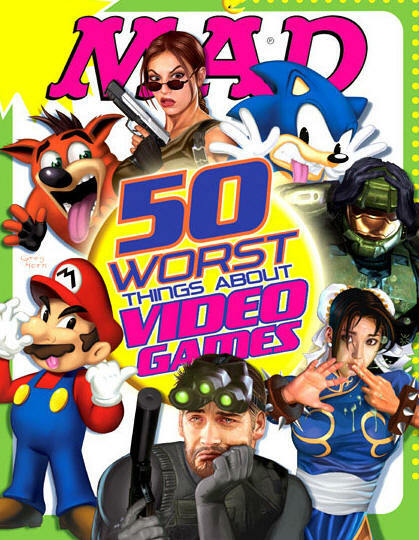 Anyway, this is my first MAD cover showing video game characters in various states of disgust! They are Lara Croft, Sonic the Hedgehog, Master Chief from Halo, Chun-Li from Street Fighter, Sam Fisher from Splinter Cell, Mario from Mario Brothers, and Crash Bandicoot. If you'd like to experience more of my incredible rapier-like wit, simply search my fabulous site! 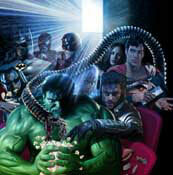 ....Or check out the Movie Opener I did for Wizard--one of my favorite pieces of art ever!